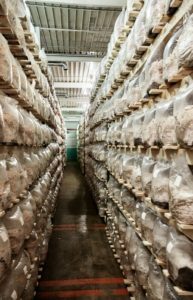 Tufpak | Life Science | Manufacturer of Specialty Engineered Plastic Film & Bags | TUFPAK, INC.
For the previous 20+ years, Tufpak has provided a segment of the agricultural industry with high quality, autoclavable breather bags used for mushroom spawn cultivation. We have a business relationship with a wide array highly satisfied commercial & independent small spawn producers and we are looking to expand our customer base. Our current customers, both large and small, have relied on our specialty engineered bags for their consistency of formulated film construction and functional performance. Our bags have brought cost savings to our customers in the form of reduced spawn run time, reduced spoilage due to contamination and higher returns brought on by increased overall crop yields. We are able to accomplish these efficiencies, by providing a bag that is constructed of our own specially formulated and uniquely manufactured SUPROP® polypropylene film, paired with a proprietary high quality breather patch material. Our bags are designed, to provide high strength film properties and controlled transpiration of biologically generated gases through the breathable membrane to sustain consistent growth of your spawn. 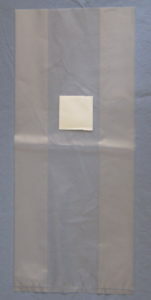 We have two stock sizes for our side gusseted autoclave bags, for 5 lb. and 7 lb. log production. The breather patch material is the same on both sizes. We are willing to supply orders as small as 1 case, but we are capable of producing very large quantities as needed. 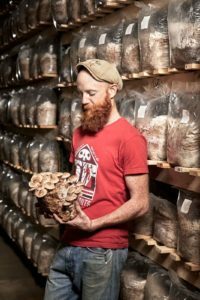 After autoclaved media has been inoculated and bag sealed off, the surface will develop a unique skin texture for the growth of specialty mushrooms. We also manufacture a non-autoclavable, optional pre-sterilized, custom lay-flat & bottom gusseted breather strip bags. Multiple bag sizes are available on a custom order basis. The orientation of the breather strip and number and size of breather strips can be adjusted to your needs. 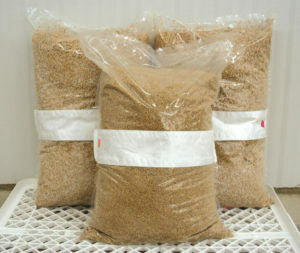 Both styles of bag have been utilized by our customers in the growth of MANY different mushroom spawn strain types. 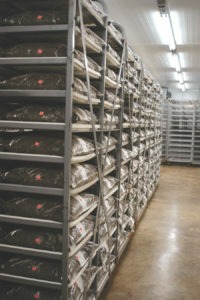 Application areas for breathable bags for use as an isolated, aseptic (sterile) bio-product environments and allowing needed transpiration of gases as experienced in bio remediation, bio pesticides, tissue culture growth, other agricultural, high volume, high quality commercial manufacturing of specialty mushroom spawn products for cultivation.